"Hello Hello HELLO! I'm Parker, but everyone at the Dog Park knows me as ParkerBarker. I like to think of myself as the official dog park greeter, though I know there's no such real position. I'll watch for your car to drive up and give you a hearty hello when you come visit! 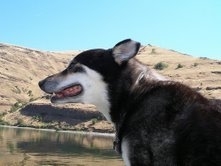 I'm an 8 year old Siberian Husky, adopted from the Eastern Washington Siberian Rescue (www.ewsr.org) in Dayton, Washington. My favorite things are running, barking, singing, talking, anything to do with any form of water, anything that can be mistaken for food, and barking! I know just how to eek out non-stop cuddles from humans--I'll sit on your foot and lean on your knees until you pet me! Just watch out ffor your pant legs in the summer. I love splashing in the kiddie pool, and will wallow and grunt in the nearest mud puddle like a pig before I settle in for cuddles. When not at the Dog Park, I'll either be inviting everyone to my house with a bark, pulling owner Ken around on his bike or cross-country skiis (I know my sledding commands very well! ), or walking around the neighborhood. I'm afraid of cats, and I LOVE spicy human food! 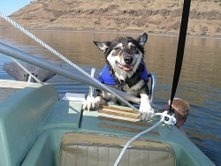 I have my own boat and life jacket. I like standing on the bow when it goes fast (Mom mumbles something about a Mack Truck imitation), and can climb back into the boat up the ladder all by myself after a good swim! 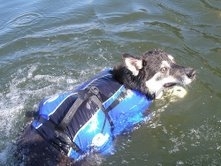 Dad scuba dives a lot, and keeps joking about finding me a doggie scuba suit. I can't wait to chase the fish under water (well, maybe not catfish). " "Uhm, well, Hi. Parker must have talked himself hoarse, so it must be my turn to introduce myself. 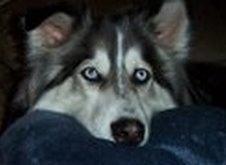 I'm Evan, a shy, quiet scardy cat of an Alaskan Husky (in my case, Siberian Husky and Rough Collie). I'm 5 years old, and also came from the Eastern Washington Siberian Rescue. I'm really attached to my owner, April. 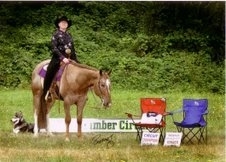 When I'm not at the Dog Park, she takes me to the boarding stable to see her 7 year old Appaloosa show horse, Beau (Zipalong Cassidy), and I get to go with her to horse shows throughout the Pacific Northwest. 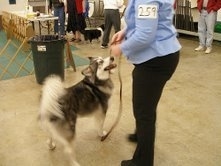 I've competed in obedience, and did fairly well! Mom has also started me in agility, but she hasn't had time to do much training. I like going to the Dog Park! I especially like chasing other dogs. I talk a lot when I play with my deep baritone voice, which makes some humans nervous (so do my light blue eyes). But I play nice, I promise! I also like to chase dogs who like to chase balls. I don't like to fetch myself, but it seems like that's the only time I can get them to really RUN! The big tires are so much fun to climb on, too, and there always seems to be a cookie waiting for me when I jump up on them! I like chasing deer and birds on trail rides, and stealing Mom's practice cones when she's trying to practice her horse show stuff. I lead Beau around by the lead rope, and love to play tug. I'm not as good in harness as Parker, but I enjoy getting hooked up and towing Mom around on her bike for a little while. "